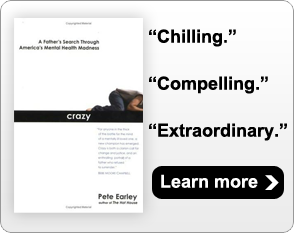 ‘The Way Madness Lies’ – Most Honest Portrayal Of How Severe Mental Illness Ravages Families and Lives That I’ve Seen! (4-10-17) You are riding in a car on a major highway with a gentle rain splashing on the windshield while you speak into a car microphone to a case worker at Oregon State Hospital, where the movie One Flew Over the Cuckoo’s Nest, was filmed. Your call is transferred and a case worker who doesn’t identify himself comes on the line. This film is unique because Sandra is a professional film maker and her brother, Duanne, who is the lead character, began using video on his cell phone when he first became ill to film himself because he wanted evidence of how he was being persecuted. The result is one of the most truthful and detailed portrayals (the documentary covers seven years of filming) of mental illness that I’ve ever seen. When we first meet Duanne, he owns a house and is a skillful restorer of rare automobiles, highly respected for his OCD-like insistence on perfection and dogged work ethic. But as with so many artistic individuals who become seriously mental illness, Duanne begins to transform before our eyes. During one delusional moment, he prepares a tent bedroom outside his house for Irina, a woman he met on the Internet and who he has been sending money to in Russia. He assures us that she simply missed her flight to join him but will be arriving shortly. She never does. Next, we listen to Duanne ranting about Pluto and the imagined wrongs of an insurance company while he stands at the ledge of Mulnomah Falls, peering over the railing at the ground some 611 feet below. But we are just starting to see the ravages. We watch as his frustrated and befuddled parents and Sandra try to convince him that a Nigerian conman, whom he has been emailing and talking to on the phone for sixteen months, is not going to send him $10.5 million dollars. When his family refuses to give him an additional $6,000 for this African huckster, Duanne sells his nationally recognized restoration of a 1964 Turbo Charged Corvair. By the time, Sandra gets involved, Duanne has delivered $40,000 to the Internet scammer. There are others who are eager in to pick his financial bones, but it’s not only Internet crooks who prey on him. After Duanne is forced against his will into the Oregon State Hospital for an extended stay, he is sent a bill for $117,895.11 for mental health services that he did not seek and refused to accept. Duanne eventually loses everything: his house, his business, his savings, and in the process, he becomes alienated from his parents and sister, all of whom have tried to prevent him from slipping further and further down the rabbit hole. In doing so, they have become the enemy and they pay for it heavily, eventually having to obtain restraining orders to protect themselves. Alone, broke and continuing to believe there is nothing wrong with him, Duanne gets stuck in the revolving door of homelessness, hopelessness and jail. Like many of us, she turns her frustration and anger into advocacy by telling producers at 60 Minutes about she and her family are being threatened by Duanne but, as Sandra tells viewers, they are told that having “an AR 15 with hollow point bullets spattering (my) brains all over my apartment” does not constitute imminent danger. When she complains about his cruel and threatening remarks to Facebook, its administers turn a blind eye. I will not disclose the ending of the film but will say that – unlike the fairy tale ending that Hollywood requires – Duanne’s struggles continue and Sandra’s love proves insufficient to health a brain disorder just as devotion and love are no match for cancer or heart disease. Sandra has spent nearly everything she has earned and saved to self-fund this documentary, picking up occasional sponsors and donations from friends. She received a third of the budget from Regina K. Scully of the Artemis Rising Foundation and Abigail E. Disney gave a substantial grant through her company Fork Films. Despite her best efforts, she still needs more than a hundred thousand dollars to pay for post production and legal services. That lack of funding forced her to withdraw from one film festival where she hoped to attract funders. Undeterred, Sandra told me that she has scheduled the premiere of “That Way Madness Lies…” for May 11 in Portland, Oregon where it all began. Her film shows viewers the horror that serious untreated mental illness inflicts without sugar-coating and it reveals the shackles that prevent families from interceding, the inability of our current mental health system to help the severely and persistently ill, and the modern day charlatans who preach that paranoid schizophrenia is not real, that all medicines are poisons, and that Americans who roam our streets psychotic are electing to live in a world that daily torments them. “That Way Madness Lies…” is a member of the International Documentary Association’s Fiscal Sponsorship Program. This allows donors to give to the film easily and securely. All donations are tax deductible to the fullest extent of the law. You can make a donation here. To learn more about the film go here. Those are all good questions. Please support and see this film.